Off-axis lens platforms are high torque rotary stages that are primarily used to rotate the lens under test and image analyzer for off-axis testing of infinite conjugate and afocal optical systems. Lens platforms can also be used for other precision rotation testing requirements such as setting the object plane tilt angle for endoscopes with specific distal angles. 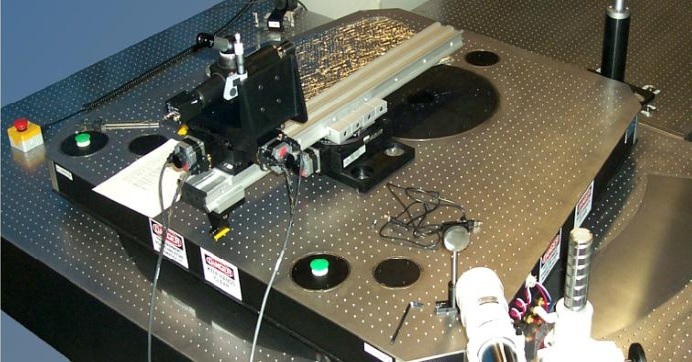 Off-axis lens platforms are used on systems mounted on optical tables and conform to 500 mm optical axis height. The newly designed LP-1000 is Optikos’ flagship lens platform and has been thoughtfully designed with capacities and features that ensure it can satisfy the testing requirements for the vast majority of lenses. The rotary stage consists of two substantial aluminum castings – the stator that remains bolted to the optical table, and the rotor arm which carries the lens under test and the image analyzer. Designing our own rotary stage has enabled us to take advantage of an important difference between the requirements of a lens platform and those of more generic rotary stages, namely that a lens platform does not need to rotate continuously. By restricting the angular travel of the stage to ±150° we have been able to incorporate a cable management system within the stator that eliminates the trailing bundle of cables of earlier systems. Besides eliminated trailing cables, the new Optikos Motion Control (OMC) system incorporated into the LP-1000 significantly reduces the number of cables required by placing the control system in close proximity to the drive elements. A custom designed microcontroller circuit drives the platform through a stepper motor pinion drive while monitoring the angular position feedback from a precision optical encoder. The ability to close the position loop on a stepper motor provides the accuracy of a servo system with the stability of a stepper motor. At the press of a button mounted at the end of the rotor arm, the motor current is powered off and the motor coils decoupled from the drive so that manually rotating the arm poses no danger to the electronics from back-driven EMF. Should the operator attempting to move the arm without first de-energizing the motor then the control system will protect itself by disengaging automatically. The angular calibration data is stored locally so that position commands are issued directly in angular units. Commands are sent to the drive over a CANbus architecture conforming to the OMC system. These commands may originate from a host computer or from the HC-1000 handheld controller. Optical rail arrangements have long been built around cast iron or aluminum extrusions along which carriers may be slid and locked in position. Sometimes a printed or engraved scale is affixed to the rail with corresponding pointers attached to the carriers. The LP-1000 takes a more sophisticated approach to this problem by using precision linear ball-bearing slides that run along hardened steel rails. A pair of rails is mounted to the machined surface of the rotor arm and is factory aligned using an optical technique to ensure straightness of travel. Two carriages run along the rail system. The forward carriage supports the lens mount while the motorized image analyzer positioning assembly mounts to the rear carriage. A magnetic linear encoder runs the length of the optical rail with the read head mounted to the image analyzer carriage. The encoder is used to measure parameters that involve translating the image analyzer. For example, the operator may move the image analyzer forward to focus on the rear surface of the lens under test, zero the linear encoder position, and then retract the image analyzer to focus on the image formed by the lens. The encoder reading is then equivalent to the back focal length of the lens. Flange focal length is measured using a similar approach. Because one of the central features of the LP-1000 is the integrated cable management system, all units are shipped with fully-populated cable ways regardless of the accessories that are supplied at the time of purchase. Doing so ensures that the cable paths for future accessories will be in place without the need to return the unit to the factory. Populated cables include CANbus, OMC power and E-stop bus, coaxial signal cable, detector power, Gigabit Ethernet, CameraLink, and a general purpose 9-pin D-sub connector cable. Occasionally, the LP-1000 is unable to accommodate particularly massive or oddly shaped optical assemblies and, in these cases, the more flexible mounting arrangement of the HT-100 lens platform may solve the problem by presenting a mounting plane rather than a rail geometry. The HT-100 is a high resolution, direct drive rotary table that floats on three air-bearing pucks. It is typically used to support and position massive optics. The system includes a 2.5 m x 1.5 m optical table with an integral rotary platform. The rotary platform is a four-inch thick honeycomb structure comprising a hub assembly, encoder, drive assembly, and coupling. The HT-100 is also equipped with a riser to mount the image analyzer, and is supplied with electronics to drive the stage and read the encoder. Electronic and pneumatic valves are provided along with a manifold for regulating the flow of air to the air bearings. The air bearings require a source of clean compressed air. The LM-300 is an L-bracket for use with Optikos lens mounts. Custom lens mounts can also be designed upon request. The LM-300 Lens Mount Bracket is supplied with the LP series off-axis platforms. The LMA-10 is a C-Mount-threaded insert for the LM-300 Lens Mount Bracket. The LMA-20 is a self-centering three jaw chuck for the LM-300 Lens Mount Bracket. It can accept lens barrels from 5 mm up to 25.4 mm diameter. The LMA-30 is a three jaw chuck adapter for the LM-300 Lens Mount Bracket. It can accept lens barrels from 25 mm up to 80 mm diameter. diameter. The stage incorporates crossed roller bearings for high concentricity and high load capacity. Optikos Automatic Rotary Lens Mounts allow users to select the measurement orientation for the optical system under test. The unit under test rotates about its optical axis at the nominal optical axis height. Two models are available to accommodate optical systems of different sizes and weight. Both models have an integral home position sensor and rotate about the standard 330 mm (13 inch) optical axis height. *Where D (in mm) is the distance from the center of the rotating annular ring mounting surface to the center of mass of the unit under test.